Ligaments are strong bands of tissue that connect bones to bones. 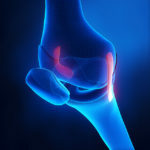 In the knee there are four major ligaments that connect the thigh bone (femur) to the leg bones (tibia/fibula). The ligament on the inside of the knee is called the medial collateral ligament (MCL) and the ligament on the outside of the knee is called the lateral collateral ligament (LCL). The MCL and LCL stabilize the knee from side to side motion and can be stressed (sprained) or ruptured (torn) with awkward motions or falls. See the section on ACL injuries for description of the other two major knee ligaments and their functions. There are varying levels of severity with collateral ligament injuries. MCL injuries are much more common than LCL injuries. LCL injuries are more likely to be involved when there are multiple knee structures injured, such as in the setting of a knee dislocation. The mainstay of treatment for sprains or incomplete tears is non-surgical, such as, bracing, modified or non-weightbearing, ice, medication, and therapy. Surgical repair may be indicated if you have a complete tear.